DYNATUNE SUSPENSION TUNING MODULE is an ulterior development of the Standard Ride Feature Tool in DYNATUNE R&H and comes as a powerful standalone tool. In STM do exist interactions between Front & Rear Body and non-linear damping is more accurately represented by instantaneous Force-Velocity Gradients of the measured damper curve for the complete damper velocity range. Furthermore, by switching from a linear Laplace Transformation to a fully non-linear numerical integration/differentiation of the ride equations, the tool allows a lot more in-depth analysis of the spring/damper/suspension system and provides - with respect to the Standard Ride Tool in DYNATUNE R&H - more detailed results both in the Time, as in the Frequency Domain. The tool comes with a "Control Section Panel" with convenient Scaling Factors for Spring Rates and Damper Jounce & Rebound Force Velocity Curves, allowing very quick optimization cycles. driven by the DYNATUNE philosophy to achieve maximal results with the absolute minimal amount of input data. The tool is based on a standard MS EXCEL ® workbook and does use next to the standard workbook functions, also some additional custom written VBA code for the "live" Fast Fourier Transformation in the Frequency Transfer Function Algorithm. NOTE: DYNATUNE SUSPENSION TUNING MODULE (STM) IS NOT INCLUDED IN THE SUSPENSION DESIGN MODULE (SDM) BUT COMES AS A STANDALONE TOOL ONLY. The DYNATUNE STM Fully Dynamic Ride Model - which is being used for numerical calculating of the response of the vehicle to a road input signal - exists out of 4 DOF / 3 PART (bicycle) model with a Sprung Body, Unsprung Masses and (linear) Springs & (non-linear) Dampers. The Sprung Mass is connected to Front & Rear Spring & Damper systems. Wheels are connected to ground each via a Tire Spring and Tire Damping (which is calculated out of the number for % critical tire damping input parameter). The differential equations of motion are being solved in the time domain by numerical integration/differentiation with a step size of 0.001 sec. Next to the Damper Data some other Suspension Data have to be provided. Those parameters are the (linear) Spring Rate and the Motion Ratio of the Spring/Damper Unit to the Wheel. 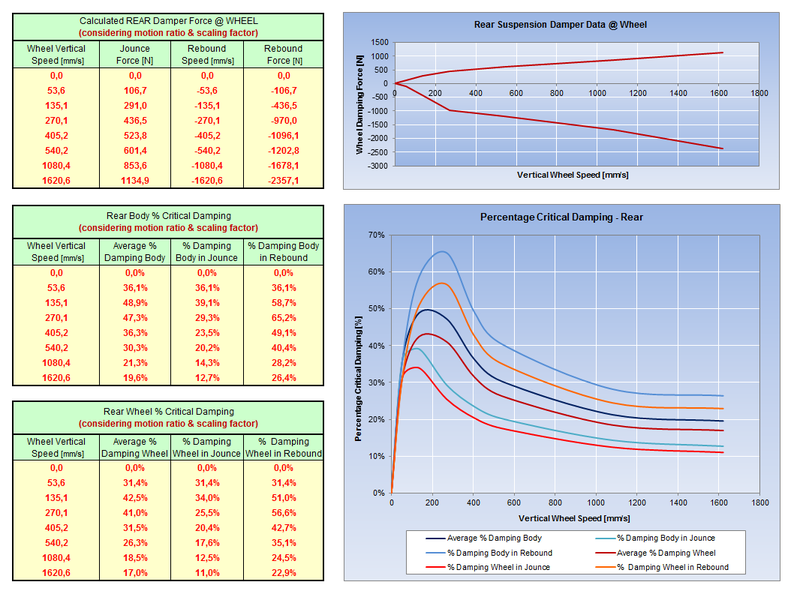 Tire Damping Characteristics have to be entered as % Critical Damping according to the usual definitions in Tire Modelling Literature. Measured Damper Data are to be provided in the standard Force over Damper Velocity format - preferably in the standard speed range of 0 to 1572 mm/s used by almost all damper manufacturers. Different damper velocities however, can be handled without any problems, but the total number of data points is fixed and has to be filled up in the data table. Any operating points outside of the provided data will be linearly extrapolated based on the last two damper data points. 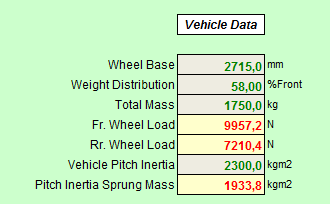 The most important vehicle data are of course Vehicle Mass, Weight Distribution, Wheelbase and Pitch Inertia, since these parameters define - next to the spring and damper data - for the major part the ride behavior of the vehicle. The Pitch Inertia of the Sprung Mass is automatically calculated out of a generic x-distance deduction of the Steiner Part of the Unsprung Masses relative to the Center of Gravity of the overall Vehicle Pitch Inertia. DYNATUNE STM provides 2 types of road input signals which are frequently used in the automotive world to understand and optimize the ride oscillation of a vehicle. The first signal is a Sweep Sine Function and the second signal is a Ramp Sine Function. Both signals can be adjusted in Amplitude & Time behavior and if desired the signals can be applied to one side of the vehicle only. The Sweep Sine Function is representing a road signal with continuously changing frequency content (typically from 0 Hz to 100Hz) and if desired, changing amplitude. The signal is typically used on a 4 Poster Hydraulic Rig and can be executed in Bounce Mode or Pitch Mode. Due to the sinusoidal wave content, the results can be post-processed with Fast Fourier Transformations. The Ramp Sine Function represents a smooth 1/4 sinusoidal oscillation/step to a user defined Ramp Height, allowing to investigate the response of the vehicle oscillation to this input. By setting the Ramp "Length" and Vehicle Velocity the Frequency Content of the ramp is defined and displayed. This particular information will help the user to relate the results from the Ramp Sine Test better to the results from the Sweep Sine Test. After having entered all Vehicle & Suspension Data and after having selected the various Road Inputs, the user can basically optimize his suspension setting in the "Control Panel" by modifying the Scaling Factors for Front & Rear Spring Rates and Jounce & Rebound Damper Characteristics. The "Live Feedback" of the most important results - all located directly around the control panel - make it easy to investigate alternatives and work towards the best compromise. 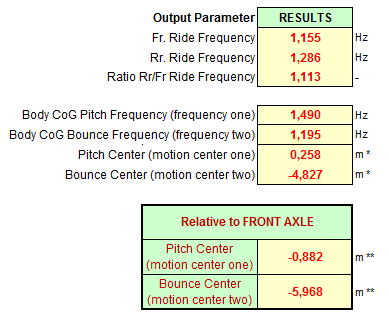 RIDE FREQUENCY & DAMPING RESULTS. DYNATUNE STM provides all the classically known numbers for Front and Rear Ride Frequencies and Percentage Critical Damping Charts for both "Jounce" as "Rebound" damper velocities corrected by motion ratio's and if applicable corrected by scaling factors. Plots are available both for Body as for Wheel damping. 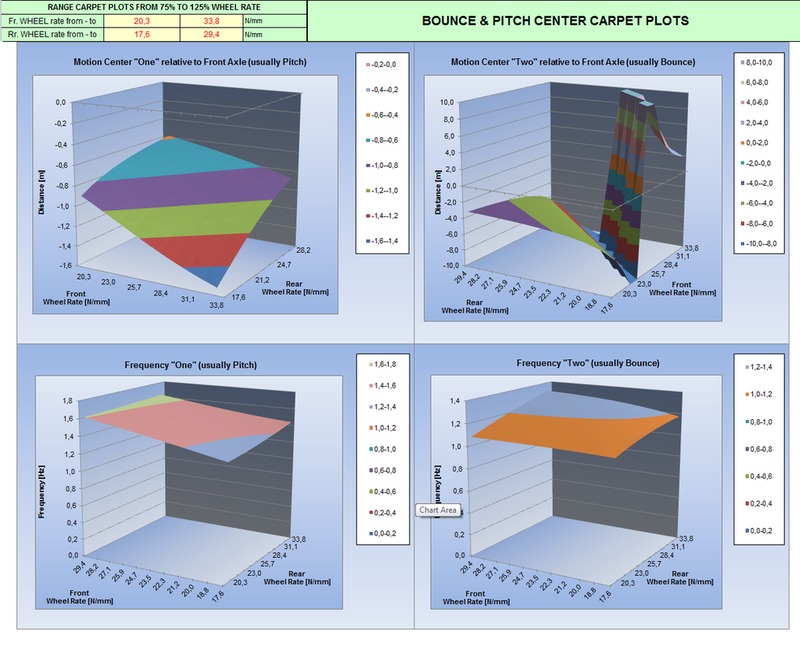 On top of that the location of the "Bounce" and "Pitch" Centers are being calculated and in order to optimize the vehicle setup Carpet Plots are provided showing the effects of a wide range of Front & Rear Wheel Rate Combinations on the location of those Centers with respect to the Front Axle of the Vehicle. 1) Damper Speed Graph - a graph that indicates what the actual Damper Speed is for a given excitation frequency. This allows a quick check to see if the damper is running in the correct operating range. 2) Dynamic Wheel Load Graph - a graph that displays the "Normalized Dynamic Wheel Load" for a given excitation frequency. This is the ratio of dynamic wheel load to static wheel load and when this value grows beyond 1, the wheel would in real life loose contact with the road. The graph does allow therefore a quick check if the road signal is suited for the vehicle. 3) the Frequency Transfer Function Graph for Body & Wheel Movements. The Frequency Transfer Function describes the relationship between the road input signal and the response of the wheel & body to this input. It basically shows, that if the road input at a Frequency of 1 Hz is for example 10mm, the Front Body would react with approximately 40mm vertical displacement and at a Frequency of 10 Hz the Front Body would react with approximately 1mm displacement. The presentation of such a chart is typically in a logarithmic scale, both for x-axis as for y-axis. The key Performance Indicators/Metrics are the Dynamic Overshoot Factors for Front & Rear Body at Resonance Frequency and a Dynamic Wheel Load Indicator that describes how close the Wheel Transfer Function remains to the Value "1". 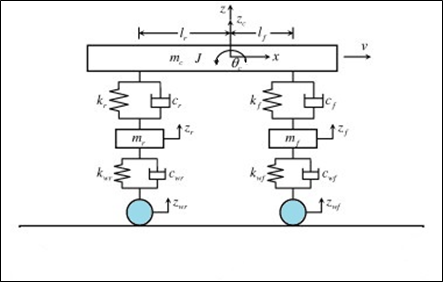 All metrics provide objective information on the quality of the Transfer Function in terns of overall damping of the system and overall capability of the system to follow & react to the given input. THE RAMP SINE / STEP INPUT RESULTS consist out of 4 graphs, all in the Time Domain. The graphs for Damper Speed, Suspension Travel and Dynamic Wheel Load are intended primarily to check whether the selected Ramp is providing the desired operating range. Beyond that the main graph shows for one end of the vehicle the displacements of Wheel & Body over time. Performance Metrics are divided into Body Movement and Wheel Load KPI's. All Body related KPI's describe objective measures for judging/describing the time behavior of the oscillation. The maximum vertical acceleration can be used for trade-offs or to confront comfort aspects of variants. The Wheel KPI's describe the effects of the Ramp on the Dynamic Wheel Load. Maximum & Minimum Dynamic Load show the severance of the event and the Dynamic Wheel Load Indicator tracks the amount of load fluctuations in the tire during that event, being therefor a suitable indicator for tire grip consistency. For overall Vehicle Evaluation all Accelerations, Velocities and Displacements of the Vehicle Center of Gravity are plotted in 3 additional graphs. The workbook contains also a COMPARISON Sheet in which all key Parameters and Graphs for 2 Vehicles are listed allowing an easy back to back comparison of variants. Have a look at the STM PDF file to find out more about it.